The approach to Pumlumon Fawr from Eisteddfa Gurig, "just the green and brown of grass and bog." Mr Poucher may be correct that Pumlumon Fawr can not offer the finest of mountain experiences, but the absence of fellow walkers and the almost trackless ascent of Pumlumon is a delight to help you truly escape the modern world. Obviously, since there are no clearly marked routes on Pumlumon, you should always ensure you carry an OS map (Explorer 213/214), a compass, warm clothes and you or your walking companions should have good navigational skills if you are not familiar with these mountains. However, there are few technical difficulties so as long as precautions are taken, these hills are perfectly safe. 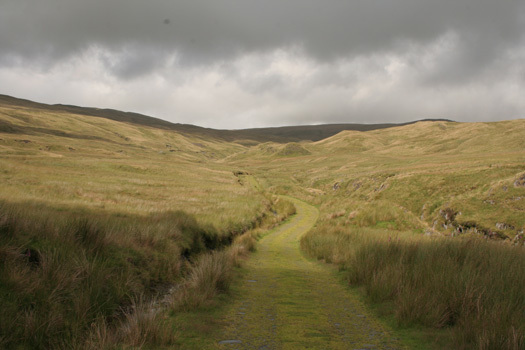 The easiest ascent of Pumlumon Fawr is from the highest point on the A44 at Eisteddfa Gurig (grid reference 796841). There is parking here for a fee or the Llanidloes to Aberystwyth bus can drop you here. Pass through the farm and exit through the gate which currently is clearly signed "All footpaths". Continue along the disused mine track. After a short distance it swings right and climbs by a small stream to a large disused lead mine. At the lead mine bear left up the faint ridge. There is a path of sorts and a few very old way-marker posts. Further up, cairns will lead you to the summit. If in doubt continue ascending bearing very slightly left and head for the highest ground as you will then meet the main ridge connecting Pumlumon Fawr to the peaks on the Plynlimon massif. The Llanidloes to Aberystwyth bus service can drop you on the A44 for ascents of Pumlumon Fawr. Ask the driver for Eisteddfa Gurig (not all drivers know the name - describe it as the "small hamlet just near the Elvis rock" - the Elvis rock is a well-known painted rock by the side of the A44) and ask your driver for approximate return times. A longer ascent is from Dyffryn Castell further along the A44 (grid reference 775817) - follow path from the hotel to the ridge which leads to the summit. Or from the end of the minor road by Nant-y-Moch reservoir (grid reference 775880) - further information on climbing from Nant-y-Moch.